Your albertapatients community is growing steadily this month, even in the peak of summer vacation season. It’s gratifying to observe the conversations that are unfolding and the new ideas that are being raised. We’re approaching 3,400 members and hoping to be 5,000 by late October. Thank you to those who have made referrals and asked to be albertapatients ambassadors (see below)! Please keep telling family, friends and acquaintances. Our discussions and what we can learn and share with decision-makers in the health care system will be richer with a larger and even more diverse community. This month we have a wholly new topic for you: Injury prevention. Read on for more information. September will be my last month as president of the AMA. I look forward to introducing you to my successor, Edmonton psychiatrist Dr. Padraic Carr. I will have some farewell thoughts for you in our next newsletter. In the meantime, have a safe and happy rest of the summer. Many albertapatients members have expressed interest in discussing the importance of preventing disease and injury, and this is a topic that interests us as well. Prevention is a broad topic that encompasses many aspects, but one theme that tends to emerge more frequently during the warm summer months is recreation safety and preventable injury. Please read on to the Did You Know section (below) for some information about ATV safety that we found interesting. Head injuries and headlines… ATV safety is a hot topic. Did you know? Several stories surrounding the use of all-terrain vehicles (ATVs) have surfaced in the media lately. That’s because the statistics are alarming. According to the Alberta Centre for Injury Control and Research (ACICR), there are an average of 14 ATV-related deaths in Alberta every year, and of those who died while riding an ATV, 68 per cent were not wearing a helmet. As it stands, ATV operators in Alberta are not required by law to wear a helmet. Nor are they required to have an operating license, be over a certain age, or have any safety training. Data from the ACICR indicates that Alberta has more ATVs per capita than anywhere else in the country, yet Alberta remains the only jurisdiction in Canada that doesn’t have ATV helmet legislation. Government has been called on to enforce stricter ATV safety laws in Alberta that would make it illegal for anyone to drive or ride an ATV without a helmet. The Alberta Medical Association supports this call to action, and we’re interested in what albertapatients members think. 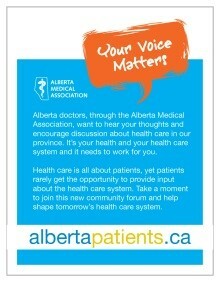 As you know, albertapatients is focused on health care and health-related topics that matter to you. Would you be interested in participating in a survey or discussion forum about ATV safety, and injury prevention issues in general? To indicate your choice, please click one of the links above before September 9, 2016.